This tiny bunny is only about 4 1/2 inches tall, but he has a lot of personality for his size. Finished size: Finished size: About 4.5” (11.5 cm) high. If you need a bigger bunny, just print the pattern in a larger size. I painted my bunny with chalk paint to give him a nice soft coat, but any acrylic paint will work just fine. I used one pound of Apoxie Sculpt to make the bunny sculpture, and there was enough left over to make the Baby Unicorn, too. Click here if you’d like to make both the unicorn and the bunny and save $5 for the two-pattern set. Bendable wire. 10 gauge armature wire or any wire that can be bent into the shapes on the pattern. Latex or Nitrile gloves if you’re using Apoxie Sculpt. Apoxie Sculpt or air dry clay. (You can find my air dry clay recipe in the Paper Mache Art Library). I am a paper clay sculptor and have never used plaster cloth. Is this an item you make yourself or purchase? And I love the bunny. May I ask how talk it stands? Thanks for any info. Hi Loretta. The bunny is about 4.5” (11.5 cm) high, but you can make it larger just by printing the page larger. You might have to take it to your local printer to do that, if you want him to be bigger. The plaster cloth is the material that doctors once used to make casts for broken bones. Now it’s used for crafts. You can find it in craft stores, or online. 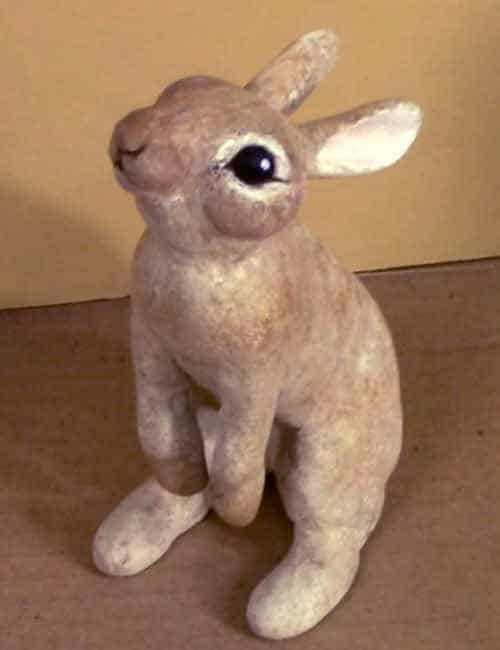 This rabbit could be made with the air dry clay instead, although I haven’t tried that yet. I hope that if someone does make it with something other than the Apoxie Sculpt that they’ll let us see how it turns out. Thank you for sharing your fabulous information. I imagine you working on these fabulous progects and being so content and happy. I am envious. You’re welcome, Martha. And you’re right – when I’m working on a sculpture I’m too focused to be unhappy or anything but content. It’s good therapy that way. I hope you join us and make some sculptures of your own, if you haven’t already. Jonni, this little rabbit is so adorable! You have really captured such personality! I find people really like sculptures that have more than one component to it. Of course, that means you must have a base though. I often spend as much time on the base as I do on the actual sculpting. Not my favorite part of the process I must say. 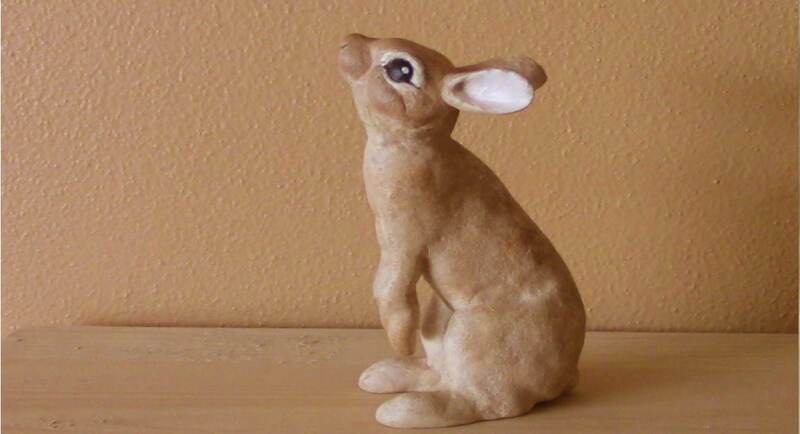 I would like to try this bunny using your smooth air dry clay…maybe after the holidays! 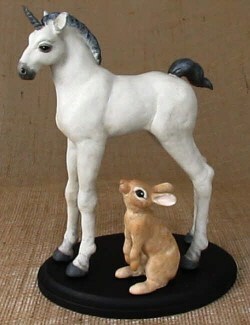 I look forward to seeing the bunny with the unicorn all painted and mounted. Thanks, Eileen. I admit that I’m going to cheat on the base. It won’t be at all as nice as the ones you make. I bought an wooden oval online, and I’ll just sand it and paint it. I look forward to seeing how your bunny turns out with the air dry clay. The only thing I find with buying a pre-made oval is that they are usually made with softer, more inferior wood with knots and imperfections on it. I get my wood from Lowes or Home Depot, usually a walnut or other hard wood, get my brother to cut it as he has the tools, then sand and stain. Really a laborious part but since I show these items, it is worth it. A necessary evil as it were! I will certainly post when I do your bunny. I’ve been using apoxie sculpt for years, but never thought about transferring paper mache” techniques! My sculptures and puppets are so heavy, but durable. Do you find that using Apoxie Sculpt this way is still durable? How would it hold up to dropping? I’ve asked for 2 of your books for Christmas. Keeping my fingers crossed! As for durability of Apoxie Sculpt over foil …. My lovely cat knocked my test unicorn off a high shelf, so I have experience with this issue. The sculpture cracked in several places along the neck, and lost one ear. It’s all repairable, of course, with more epoxy clay, but my cat was in the doghouse for a few hours. I used a layer of Apoxie Clay that was almost paper thin, to cut down the cost, and that might have made a difference, but I have also dropped some of my paper mache sculptures. The ears do suffer damage, which seems to be unavoidable, but the bodies have never cracked. Apoxie Sculpt doesn’t have the paper fibers that help hold the paper mache clay (and traditional paper strips and paste) together. I don’t want to discourage you from trying it, but you might want to do an experimental piece first, to see if it would hold up for your purposes. The foil armatures definitely cut down on the weight. I think the strongest and lightest method I’ve come up with so far is to use a few layers of plaster cloth over a clay sculpt, remove the clay to leave a hollow core, and then use either the Apoxie Sculpt or the smooth air dry clay over the plaster cloth. My doll heads and my rhino were made this way (with the air dry clay) and they’re both strong and light. The fibers in the plaster cloth provide the reinforcement, and the outer layer provides the texture and details. I don’t really want to drop one of my doll heads on the floor to test it, but I’m convinced they would not crack – although they might lose an ear. Of course, I could be wrong, so you’d need to experiment. By the way, I would love to see some of your Apoxie Sculpt pieces. Would you be willing to upload a photo or two? Lovely! 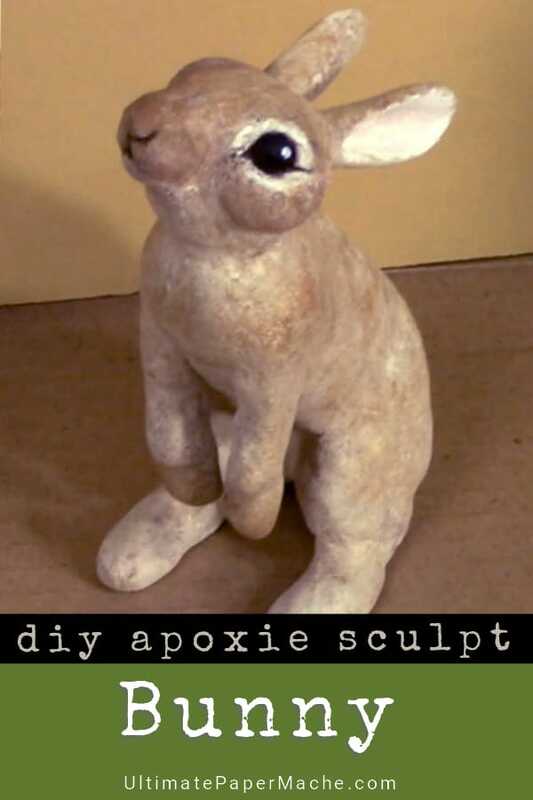 I truly enjoy working with Apoxie Sculpt and may have to give this little rabbit a try after the holidays. Still working on my raven and a life-size hen! Thank you for sharing your methods in such a kind way. You’re welcome. Do we get to see your raven and hen when they’re finished?